tipped to be boxing superstar. Meet Lexi, the pint-sized boxer who is being tipped to become Cumbria’s next sporting superstar..
Lexi Dixon works in the gym Head coach of Wigton Amateur Boxing Club Andi Crossman believes she has what it takes to reach the top of the boxing world, should she stick at the sport. 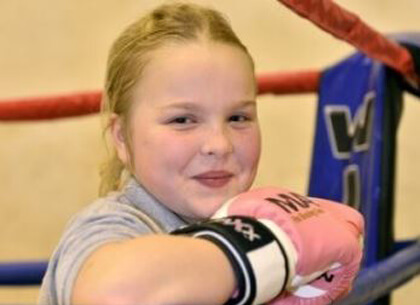 Eight-year-old Lexi, from Wigton, has been inspired by her older brother Robbie Pattinson, a champion fighter himself and has been training for just six months. Despite her inexperience Andi believes he has something special in the Thomlinson Junior School pupil.